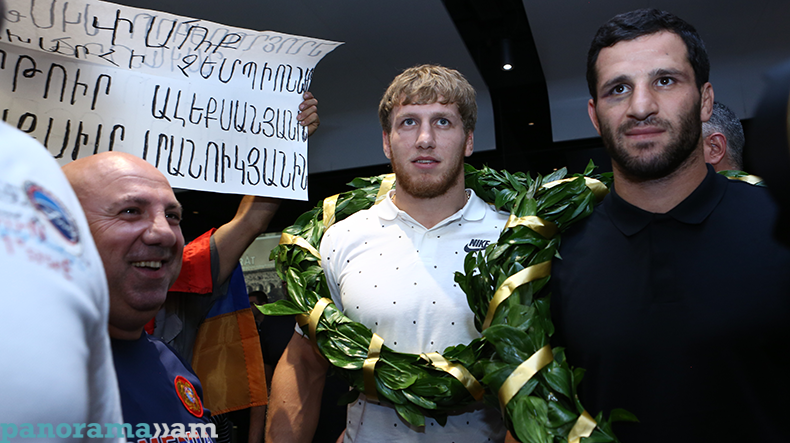 The Armenian men’s Greco-Roman Wrestling team returned home on Wednesday to a hero’s welcome by dozens of fans waiting at Yerevan Zvartnots Airport, ecstatic over the team’s two gold medals at the 2017 World Championships in Paris, France. The Armenian team conquered two gold medals at the World Championships with Artur Aleksanyan and Maksim Manukyan becoming champions respectively in the 98kg and 80kg weight categories. The athletes were greeted at Zvartnots airport by President of the National Olympic Committee Gagik Tsarukyan who crowned the champions with laurels.